Within an hour of finishing a mocha at Mid City Caffe, I’d sped through the end of a dense Turkish mystery, sent some twenty frantic texts, moved mountains, healed the sick, and dropped way too much decor dough at Miss Pixie’s downstairs, lifting a huge wool rug effortlessly above my head the several blocks home. I did almost everything after that divine cup of chocolate and coffee except leap tall buildings in a single bound. 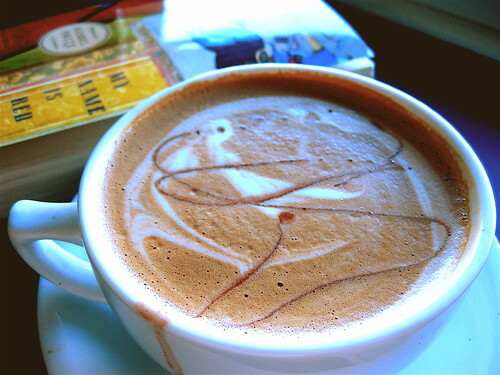 And was already dreaming of my return to try a morning cappuccino or drift away a whole afternoon with a french press. Now that’s prime bean. Mid City may be a small bare bones cafe, but it’s already popular with the Logan Circle crowd salivating over the prospects of a regular coffee stop. This is an area long bemoaning the death of Sparky’s, 14U, Mocha Hut – we want a basic place to lounge with high-quality java that isn’t Starbucks or Caribou, simple as that. I’d argue the ‘hood needs more cafe-type joints – sure I’m super excited about restaurants like Masa 14 opening but really, we’re an underserved area for just plain – basic - good. Up the stairs you’ll find a cafe divided into two small rooms – one with the friendly bar serving espresso drinks and french press coffee, pastries and a few goodies like cinnamon raisin brioche toast with a choice of spreads (like nutella… drooool). This first room has tables and some cushioned spots, best for meeting folks and hanging out with the free wi-fi. The second room is tiny, lined with mirrors, counters and a wide window overlooking the Mission. The tight quarters might put some people off, but I actually liked the intimacy and the counterstools, perfect for a half-hour’s read. This room also has a wall of newspapers for sharing which is a nice touch. Music was playing at a just the right volume, and there was a decent level of chatter but nothing too strident. It’s not really grungy, or swanky, or indie – nothing too scene-defined, which is a relief. It just is – a great little spot to sit with your coffee. Within days of my mocha fix, I was shaking with anticipation for my next visit. They serve Counter Culture, and sustainable coffee sure tastes damn good – not bitter, not burnt, just right. Testimony to the barista’s skill as well. My new third place. It’s just such a bummer that it closes so early!